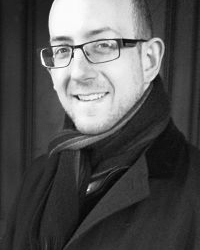 Justin Harmer, bass and pianist, was a music scholar at Westminster School, exhibitioner at Trinity College Junior Department, and a postgraduate exhibitioner in voice at the Royal College of Music. He has worked variously as a repetiteur at the Royal Ballet School and Royal Academy of Dancing and as a Bass with the Royal Hospital Choir, Bampton Opera, Co Opera Co and many choral societies and other groups, at venues including Royal Albert Hall Elgar Rooms, St John’s Smith Square, St Martin in the Fields and Westminster Abbey. He is currently recording his first commissioned album of compositions. I studied piano and had private singing lessons in Italy than I took my Masters and I moved to London thanks to a traineeship programme with Naveen Arles and London International Gospel Choir. Now I’m doing another music traineeship with Esmeralda Conde Ruiz. I love different kinds of music. I studied both classical and jazz Music so is hard to say. I love composers like Debussy, Chopin, but at the same time Duke Ellington, Nina Simone. Maybe I could say my favourite piece of music is “Azure” By Duke Ellington. What single thing you could not live without? Music, of course and…. Chocolate!! South of Italy… Puglia! The land of the sun and good food! !